Galilea Rose Quartz, Pink Glass Sterling Silver Bracelet (Stretchable) and Earrings TGW 308.00 cts. 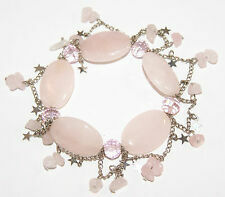 Galilea Rose Quartz Beads Bracelet on Pink Cord (Adjustable) TGW 70.00 cts. ROSE QUARTZ and GREEN AVENTURINE BEADS. 2 strand stretch bracelet. Rose Quartz Crystal Power Beads Bracelet or Wrist Mala finished with a fancy knot, also called a "never ending" knot. Elasticated for comfort, they vary slightly in size, but because they have 22 beads plus the top bead, they are around 165mm or 6.5inch at rest. Use Rose Quartz for matters of Love and the Heart Chakra, for unconditional Love, fidelity, forgiveness & happiness. Great healing gift, or Birthstone gift for Taurus, January Birthdays, Christmas, Anniversary or anyone feeling drawn to its properties. Please visit my ebay shop TRIBES AND VIBES for more Power Beads Bracelets and Crystal Jewellery. In between each Rose Quartz Bead are 5 pink glass beads. Stunning Rose Quartz Charm Bracelet in Purple Velvet Pouch. Rose Quartz is one of the most popular gemstones. It is a powerful love attractor and is the stone of unconditional love. The qualities of the particular crystal used will then influence you as you go about your life. By wearing a particular bracelet, you are inviting the energy of that particular crystal into your life. One of the best ways to benefit from Crystals is to wear them. 💕 Rose Quartz is the Crystal of Love 💕. ROSE QUARTZ Bracelet Crystal Power Beads wrist mala healing heart chakra reiki. Rose Quartz has long been used for love magick and matters of the heart (emotional and physical). It fortifies the heart and its tissues, and the sexual organs. It imparts empathy with others, sensitivity, self-worth, the ability to love and be loved. Rose Quartz is a true stone for romance and relationships, or for those looking to invoke love. It draws off negativity and replaces it with calmness, and peace. It is also said to calm hyperactivity in children. Rose Quartz is associated with the Heart chakra, and is also used in many forms of Holistic and Reiki healing. Rose quartz gemstone beaded Bracelet Only worn a few times, looks as good as new Threaded with elastic so fits most size wrists Rose quartz is a crystal which symbolises unconditional love Not to be missed! Gemstone bracelet originally purchased from Psychic Sisters. New without tags. Bracelet is approximately 2.5 inches x 2.0 inches. Bracelet is elasticated to fit different sized wrists. 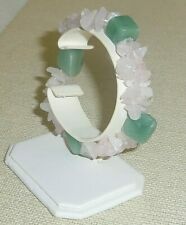 For sale is a large stone chip elasticated bracelet. The bracelet is in good condition. Huge rose quartz lookie likie Lucite pebbles/rocks. super to wear as everyone thinks its rose quartz. very pretty colour and a great faux creation. very retro. Material: natural rose quartz stone. bead size: 8mm. Material Rose Quartz. hope you could understand. (weekend and holidy not included. ).